Greta Gerwig is starring in a film about a free-spirited Millennial woman living in New York trying to make her way through life and all of its many complications… and it ISN’T written or directed by Noah Baumbach?! No, it’s actually filmmaker Rebecca Miller who’s pulling double duty as writer-director of Maggie’s Plan, her first film since 2009’s The Private Lives of Pippa Lee, and while Gerwig is once again playing the same sort of role we’ve seen from her in films like Frances Ha and Mistress America, this film proves that nobody does it better than her. She plays the titular role of Maggie, who is eager to inseminate herself with the sperm of former college acquaintance and now “pickle entrepreneur” Guy (Travis Fimmel), in order to fulfil her dream of becoming a single mother. However, an unexpected meeting with a fellow teacher named John (Ethan Hawke) changes everything, and soon both of them fall in love with each other, despite John being married. A few years later, Maggie is now married to John and has a young daughter, but she feels that John is becoming too distant and unreliable, and even wonders if she’s falling out of love with him. 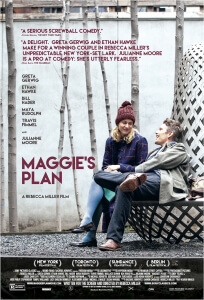 She eventually comes up with a scheme to get John back with his ex-wife Georgette (Julianne Moore), who’s secretly just as eager for a reunion with her ex-husband as Maggie is, and so the plan in Maggie’s Plan gets underway. What you see is what you get, a quirky comedy-drama centred on a particular group of people that relies on words and brains for laughs instead of more physical slapstick, but it’s very entertainingly so. Miller’s sharp and quippy screenplay – based on a story from author Karen Rinaldi’s as-yet unpublished The End of Men – clearly takes inspiration from the classic screwball comedies of yesteryear such as Bringing Up Baby and The Philadelphia Story, more specifically in the quick back-and-forth dialogue that gets straight to the point as well as the laughs, and there’s even a hint of Woody Allen thrown in to the characters’ neuroses and interactions with each other. Against the odds, they end up blending well together, creating a taste that’s not too smart-alecky and pretentious for anyone outside of a certain audience to admire, while also boasting particular smarts that not many comedies of this type can really claim to have. This is particularly true with its cast of characters, who are written as real people with real flaws instead of cartoony archetypes with a very black-and-white perspective of the world, and brought to life by actors who respect the audience enough for none of them to fall into that easy hole. Gerwig is perfect casting as Maggie, with her previous experience in indie comedies paying off to here give a performance that is both funny and touchingly sweet, even when she’s clearly acting on her own insecurities brought about by faint ego and a rough childhood. Hawke, too, excels as a man who is ultimately unsure of what he really wants to do and be, acting on impulse instead of his supposed intellect, and finding himself constantly lost because of it. The only one who comes closest to being an all-out caricature is Moore as the Danish-accented Georgette, but even then the actress scorns stereotype and presents her as an understandable figure, spoiled by her own success and eager for a second chance to prove herself. Watch out too for Bill Hader and Maya Rudolph as a couple of friends who, as we can expect from the SNL alumni, never fail to deliver. Though Gerwig is very good here, it’s understandable why some people would be put off by her typecasting – by this point, “Greta Gerwig As A Disillusioned Millennial In New York” should be its own genre – and want to see this sparky and charismatic actress reach out of her comfort zone and tackle some more challenging roles. However, like we said, if there’s one thing that Maggie’s Plan proves, it’s that there’s nobody who can really perfect this kind of character like Greta Gerwig can, and even if you can’t see past her apparent inability to try new things you can still appreciate this film for what it is: a smart and deftly funny film that takes its audience seriously and gives them something that will leave nothing but positive impressions after seeing it. Maggie’s Plan is a smart and precise comedy-drama where a great cast, led by the ever-reliable Greta Gerwig, bring to life a screenplay by Rebecca Miller that lovingly calls back to the mannerisms and rat-a-tat dialogue of classic screwball comedies, but stands on its own as a funny and sometimes provocative exploration of the modern desire for everything and nothing.